Is your team discussing Data Archiving for SAP, yet you feel in the dark? 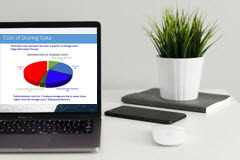 This Fundamentals of Data Archiving course is designed to introduce you to the basic concepts of archiving, the terminology, reasons to implement an archiving project, and the expected results from the project. You will learn the various phases of the project while best practices and industry standards are presented and explained. Robert C. Weber, CPIM, CIRM has over 20 years of experience in SAP Cross Application skill sets which includes 15 years of full life-cycle archiving and other SAP experience in security, data volume management and project management. Some of the companies he has performed archiving services include Bristol-Myers Squibb, Hitachi, Butterball Turkeys, Home Depot and BMW. He is certified in the APICS CPIM (Certification in Production and Inventory Management) and CIRM (Certification in Integrated Management) and has taught 50 certification courses at multiple companies and colleges.